Babywearing is the art of securing your darling child to your own body in some temporary manner which allows you to carry them around without having to hold them in your arms. It’s great, and you should definitely try it out. This is not a comprehensive guide, nor is it based on years of practical experience —try the NCT guide for something a little more professional. I’ve been using a sling for a grand total of 12 weeks, so at best I’m aiming for a quick-start guide and some pointers on where to look next. If that’s what you’re after, let’s plunge in to the topic together. All slightly dull, and not really of interest to us at the pointy end of parenting. Wikipedia has a ‘fascinating’ article on baby transport if you’re desperate to know more. However, if you assume that Mrs Caveman was unlikely to have had access to the latest in wheeled-pram technology, it’s a reasonably safe bet that she tried tying her offspring to her when moving around. 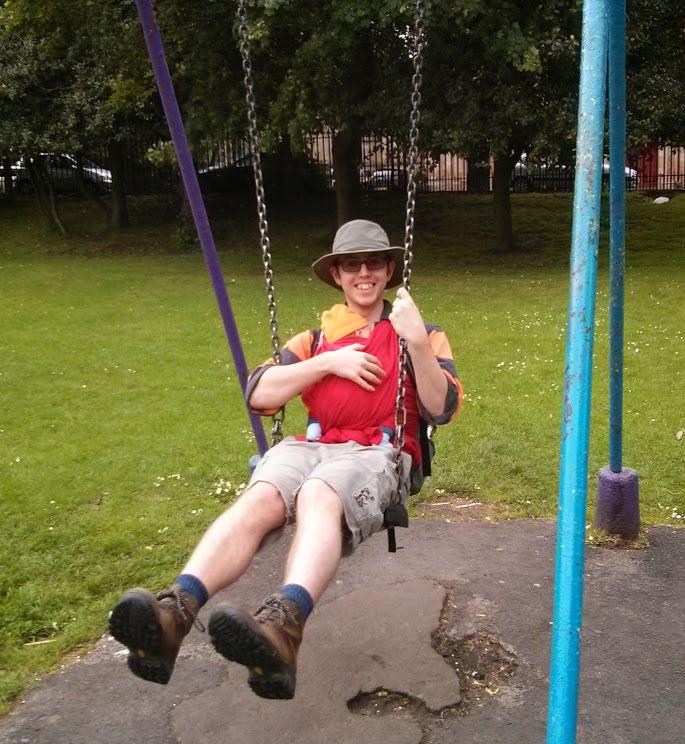 You can put ‘improved ability to fend off sabre-toothed tigers’ in the plus column for babywearing. More interestingly (in my mind) there’s a feeling that babywearing ties neatly into the fourth trimester interpretation of baby development. The sling provides a very womb-like environment—warm, audible heartbeat, muffled outside noises—for munchkin to curl up in whilst getting on with the tricky business of sorting out the connections in his or her massive brain. Most other mammals are born ready to face the world, but if a human tried to grow a fully functioning brain in utero then his or her head would be too large to fit through mum’s pelvis. Instead we’re born half-baked and complete our basic neurological development in the outside world, relying on almost kangaroo-like parental care to initially keep us safe. What is modern babywearing, and why is it so good? In the western world, babywearing has become fashionable again partly due to something called ‘attachment parenting’. This was a theory developed by paediatrician William Sears geared towards building a strong emotional bond between parents and their baby. Babywearing was included as one way of helping this bond develop. Personally, I suspect the bonus of being able to climb stairs, fit through narrow gaps, and not have to lug a pram everywhere has been at least equally influential. Let’s say you fancy a warming drink to boost your morning after a night of no sleep. Babywearing means that your primary concern is not “can I fit this enormous pram in amongst these chairs?”, leaving you free to pick the cafe that actually serves the best coffee. Taking munchkin anywhere with steps or stairs, like a shopping centre, museum, public transport, or your own house? Relish the fact that you’re not constantly searching for a lift. Baby sulking because you’re ignoring them whilst eating, doing housework, or writing a blog post? Stick them in a sling, and if they’re anything like ours they’ll be quite content whilst you’ve still got both arms free to carry on with whatever you were doing. Fashionable enough to be transporting baby around by bike? The sling is the ideal thing to have in your pannier to deploy once you’ve locked up. If you’re male, you will almost inevitably be drawn towards the more rucksack-y kind of carriers with buckles, straps, and other manly accessories. It’s possible that the idea of wearing something that looks dangerously like a sash or scarf makes you uneasy, particularly if it comes in pink. Before you drop £90 on that BabyBjörn, stop and think for a second about your baby’s hips. Your child’s legs are not designed to hang down straight, as if standing up. If you force them into this position (for example, by tight swaddling), you run the risk of things like hip dysplasia. This is an issue with the joint at the top of the leg, where the femur doesn’t fit properly into the pelvis — it’s a bit like a permanent not-quite dislocation. If you ever watched the American series ER, hip dysplasia is the reason Kerry Weaver used a crutch. More info on all of this here. If the crotch support of your carrier isn’t wide enough, you can also put the legs into this position. What you’re aiming for is a crouched squat; the M or froggy position. Knees should be supported higher than the bum and the fabric should run from knee to knee. Look at the picture below for my humble illustration of a vaguely correct position. Many of the rucksack-type carriers can’t do this, so the current advice from various babywearing authorities (NCT, etc) is to avoid them. If you need further convincing, just imagine being suspended from your crotch for any length of time. A Storchenwiege Leo woven wrap, artfully paired with a Tilley T3 hat and a Timbuk2 Phoenix backpack. Baby is model’s own. A very long single length of fabric with a small amount of give that you wrap around yourself and baby in a variety of ways. Seems to be regarded as something of an expert tool, which is tosh—if you can tie your shoelaces, you can tie a woven sling. You can adjust the method of tying to place the weight of the baby on your front, back, or hip; and the limited stretch to the material means that you can wear for as long as you can bear without the knots slipping or sagging. It’s also good for heavier babies and toddlers as you can keep everything tight enough to transfer the weight to your hips and not your back. Woven wraps are probably the most versatile of all these options, and the one that you’ll be able to use the longest. Down sides. Because they’re not stretchy you’ve got to tie it around you and the baby rather than tying it on you first and sliding them in. This makes some of the ties look a little precarious as you balance baby one handed whilst tightening things up. It also means that if you take baby out for whatever reason, you’ve got to completely re-tie the thing when you put them back in. Because these wraps are also really long, it’s hard to tie without dragging the ends on the floor. Wet car-parks are a bugger, although with experimentation it’s just about possible to get it on whilst still in the seat (stop sniggering at the back). Come in lots of sizes, and can double up as a blanket (complete with comforting just-like-daddy smell) in a pinch. A stretchy sling. Brand is JPMBB (Je Porte Mon Bébé), and the photo is from their website. Click for details. Like the woven sling, but stretchy! Because of the stretch these aren’t so good once baby starts packing on the pounds as the weight goes straight to the top of your back. They’re also going to start to slip after an hour or two, although you can always re-tie. The big plus point is that stretchy wraps are ‘poppable’, which means you can tie it once and pop baby in and out throughout the day. This makes them ideal for dealing with feeds, changing, and moving in and out of car seats (as you can leave the unoccupied sling tied around you whilst driving). The stretch also makes it much easier to get a snug wrap around smaller babies — it’s still possible with a woven, but requires more care. Front and hip carries are available, but not back carries. Not quite as long as woven slings and a bit more compact to carry around. Generally come in just the one size. 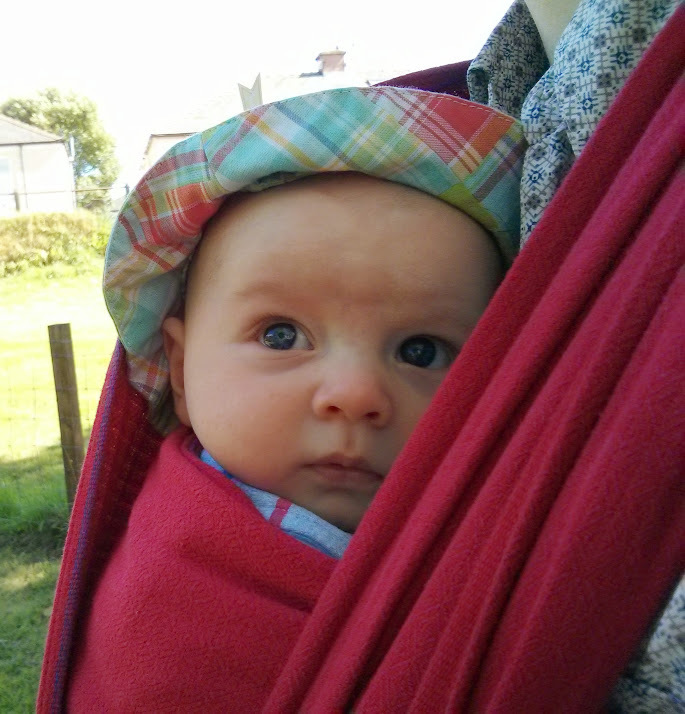 A Didymos Didysling, at the expensive end of ring sling territory. Photo from Love To Be Natural, click for info. 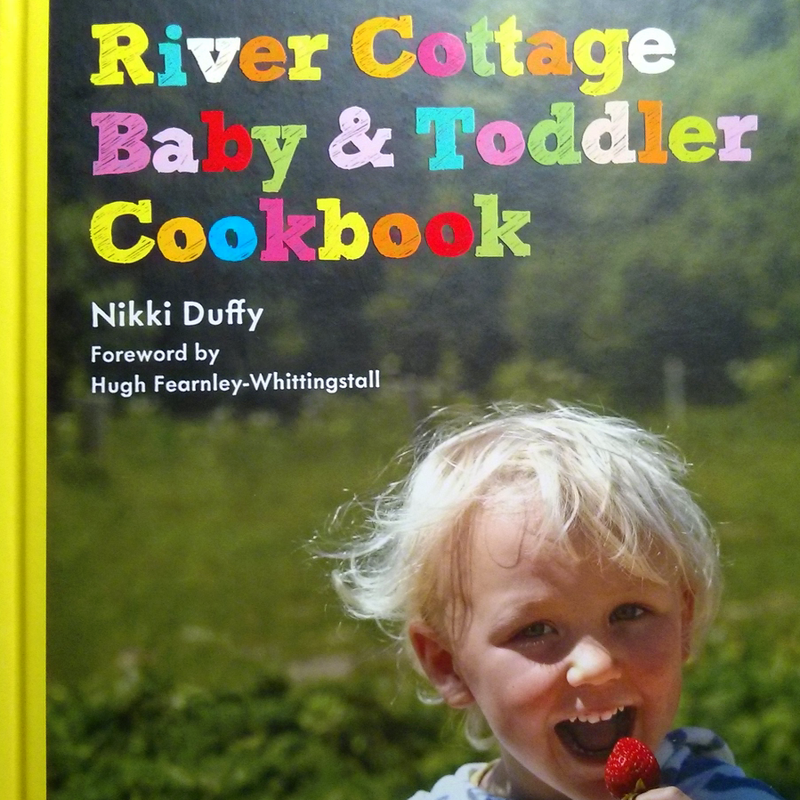 Say you’ve got a bigger baby or toddler that you need to lug around occasionally. 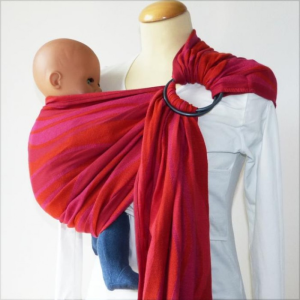 Ring slings provide a speedy way of hanging them off your shoulder in a supportive woven wrap, without the need to tie and untie it every time. All the tightening is taken care of by a pair of chunky metal rings, so baby goes in and you pull to snug it up. Not particularly versatile as they just do the one job, but if that’s all you need then they do it very well. I’ve played with one of these, but we’ve not used one in anger. The BB-tai Mai Tai carrier. The grey hair appears to come automatically with fatherhood. Another photo from Love To Be Natural, click for details. Imagine a square of fabric, with a strap coming of each of the corners. That’s a Mei Tai. Worn on your front or back the square forms the seat for baby and the straps secure them to you. Bigger babies can dangle their legs out of the sides (but the wide square still keeps them in a good froggy position), whereas smaller ones keep everything tucked up inside. There are a few comments around the web that some infants didn’t like having their feet so high, so maybe try before you buy… Certainly Owen wasn’t hugely keen on it when I reproduced that position with the woven sling (see here for how). Because Mei Tais have straps rather than the constant material of the woven and stretchy wraps some makes include padding of various kinds. If you find you’re getting sore shoulder with other types, maybe this would help. Narrow straps also mean less fabric wrapped around you, so if you overheat with a woven wrap, the Mei Tai might be better. At the posher end of the scale, Didymos Mei Tais have a width-adjustable fabric square using draw-cords, so would suit your baby from birth up until your back can’t take it anymore. The original Ergobaby carrier (which seem to be the most popular buckle carriers). The final photo I’ve pinched from Love To Be Natural, again, click for info. A baby rucksack thing, but with a wide enough support for baby’s bum to allow them to adopt the froggy position. Intuitively these should be the easiest sling to use. Buckle on, baby in, go. However, we were donated one, and it’s the most complicating thing I’ve ever worn. I’ve put on parachutes with fewer connectors. Most seem to come with some kind of newborn insert, but in my mind they just don’t seem very snuggley. I wouldn’t want to snooze in something covered in plastic buckles and canvas straps, so I’m not sure why babies would either. They’re also bulkier than any of the other options and have bits that could break if you stand on them or trap them in a car door. They clearly sell well though, so maybe if you find one that fits you and baby perfectly they become magically comfy. The Infantino Slingrider, which probably resulted in the deaths of at least three babies from asphyxiation. Click for the recall notice (which is for some reason in all caps). 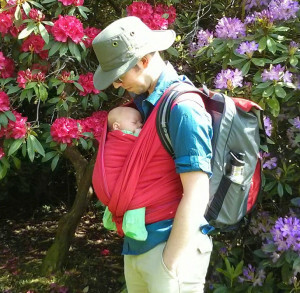 Pouch or bag slings are really simple pouches that you lie your baby in and then wear satchel-style across your body. Maybe some are better than others, but none of them conform to the TICKS safety advice (see Where can I learn more? at the end of this article), and a couple of brands have been recalled in the USA after babies suffocated whilst in them. There’s a site here where a nurse tested the concentration of oxygen in the blood of a baby in various pouch slings. With my ambulance-man hat temporarily on: this ‘blood oxygen saturation level’ (or SATS) is tested by shining light through a finger and measuring what percentage of that light is absorbed by oxygen within the blood. With everything else being well, your SATS should be above 94%. Current UK ambulance guidelines state that anyone with an unexplained SATS level below 94% should be on additional oxygen, and anyone below 85% should be on the most intensive type of oxygen mask (a big simplification of the 2009 JRCALC update). This nurse tested a number of models of pouch sling and all pushed baby’s SATS down into the low 90s, with regular dips into the 80s and, sometimes, 70s. Maybe it’s all coincidence, but with so many other options available, there should be no reason to gamble with a pouch sling. Are there any downsides to babywearing? The first sling-based question from most casual observers tends to be “aren’t you worried he’ll fall out?” The risks of baby-ejection will vary depending on the type of sling you’re using, but are probably highest with the woven wrap. If you tie the sling correctly, your child will not fall out. If you tie the sling incorrectly, your child will probably still not fall out, but better safe than sorry. Practice with something non-valuable at first (ideally with a bit of weight, otherwise it all feels a bit off. A bag of sugar, perhaps.) The first time you carry your child, setup over something soft like a bed or with a spotter ready to catch if it all goes pear-shaped. After a couple of goes it becomes second nature. It’s not as if you suddenly forget how to put a shirt on, is it? You’ll get plenty of attention from ladies of a certain age (which may not be a downside if you’re desperate for adult conversation). As an unexpected bonus, having your child close against you does seem to put off some of the touchy-feely brigade. If the thought of strangers trailing their fingers inside your pram makes you shiver, a sling is a solid, non-confrontational deterrent. The biggest issue I’ve had is a simple one—weather. 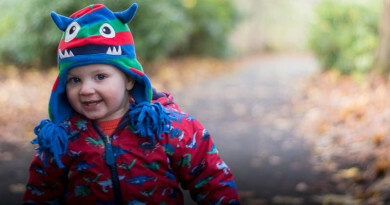 Protecting your baby from the elements whilst not smothering them is not particularly straightforward. Slightly baggy stuff that fastens up at the front works well as long as you can keep their face exposed. Umbrellas and wide-brimmed hats deal with vertical rain (and the latter with sunshine as well). There are a number of babywearing-specific coats and covers, but these tend to be a) expensive and b) lacking in male options. Providing you keep your core temperature up your baby should be cosy on cold days, but you can get a little warm in glorious sunshine. You might also find that there’s a babywearing group near you – check on Facebook (here’s the Glasgow one) or with your local NCT contact. Proper review of the Storchenwiege woven wrap (achtung!) to follow in the next few weeks. You know you hate bouncing that pram down steps. ← Where can you breastfeed?